Everyone wants to know where to go for The Great Guinness Toast. The answer is simple: Any place where Guinness beer is served. Get all of your friend together, raise a glass at 11pm and you’re in. To quote Chef Tell, “Very simple, very easy”. Have someone take a picture of you all together and email it to the Guinness people. As a community service, we’ll start a list here of local watering holes serving Guinness beer. Add your favorite location in the comments and I will update this post for all to see. Basically, almost all the local’s favorites will be in on the party. Help me out people, where else can we go tomorrow night? Note: Clarke’s said they will not be participating. I don’t know why, but that is their choice. What will you be doing this Friday at 11pm? If you answered, “Trying to break the world’s record for largest toast” you are probably taking part in the 16th Annual Great Guinness Toast. 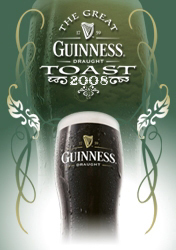 That’s exactly what those great guys at Guinness have done with The Great Guinness Toast. Sometimes known as “St. Practice Day”, made up of Guinness drinkers across the country trying to break the record for the largest simultaneous toast. Since it’s inception in 1993 Pittsburgh, The Great Guinness Toast has consistently grown, and breaks its own record each and every year. The concept of collectively raising a glass and toasting with the famous black and creamy brew is an attempt to gain entrance into one of Arthur Guinness’ other select clubs; The Guinness Book of World Records. Bars, Clubs, Pubs, Restaurants and all types of drinking establishments all around the country put up posters, hand out door prizes and even raise funds for charity, all to be a part of the famous simultaneous toast…and you don’t even have to be Irish! It’s a ritual! it’s a gathering of friends! it’s…it’s…just another reason to drink Guinness.